Francesco Verlengia in an article suggestively entitled "The Legends and the Sanctuaries of Abruzzo" ("Le leggende e i santuari Abruzzesi") published in "The Abruzzo Review of Science, Literature and Arts" ("Rivista Abruzzese di scienze, lettere ed arti") in 1916, hands down to us the news and legends about the origins of various Churches and of the cults and popular devotions linked to miraculous facts against drought, famine, epidemics, plague etc., such as the Madonna di Carpineto at Rapino, Sant’Onofrio at Serramonacesca and Santo Benedetto at Lama dei Peligni. Verlengia describes the Churches, their Saints’ statues and their religious ornaments, reporting inscriptions, parts of strophes and verses of hymns which, on the anniversary, like that of Rapino on the 8th of May, the people, "young virgins" sang in the procession, together with the brotherhood, the clergy, gentlemen and young girls dressed as little angels. In this work the author also describes the Sanctuary of the Madonna of the Roses of Torricella Peligna, which is one of the seven Madonnas of the Aventine Valley. Seven Madonnas, like seven sisters, each equally held to be miraculous "although each village has the most trusting and devout cult towards its own (Madonna)." They are the Madonna of the Altar of Palena, the Madonna of the "Vicciare" of Lettopalena, the Madonna of the Valley of Taranta, the Madonna of the Roses of Torricella, the Madonna of the Holy Saints of Lama, the Madonna of Sorrows of Civitella Messer Raimondo and the Madonna of the Free of Palombara. The Sanctuary of the Madonna of the Roses rises on a small rocky mountain about 3 kilometres from Torricella. From this Church, as from that of the Madonna of the Altar situated higher up, one can see all the other Churches that arise along the slopes of the Majella. The Madonna of the Roses is an all white Church, joined to the house of the custodian or the "hermitage". It is beaten by the winds and is close to a cliff where the village called Santa Giusta is situated, with its elementary school that is run by the Town Council of Torricella. One enters the Church under a canopy by the only door; on the doorway one can read an inscription saying it was restored in 1500. "The statue of the Madonna, portrayed sitting with the Baby on her knee, is not very interesting as it belongs to that series of Abruzzan idols of an indefinable era that move us by their very coarseness and make us think of the naïve devotion with which the rough people, peasants and shepherds, surround her." spreading itself over the meadows of flowers with the fresh scents that come from the sea and the mountain." 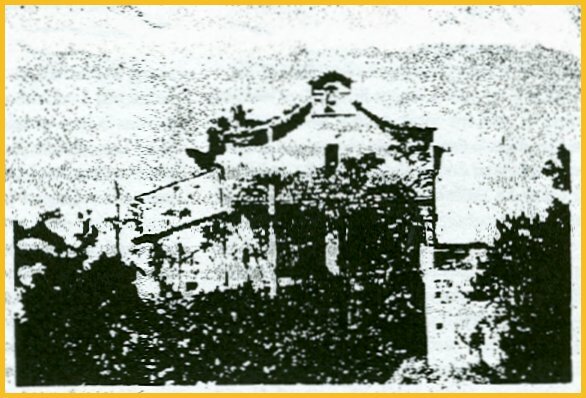 All the nearby villages participate at the Feast day, visiting the Church and losing themselves in the surrounding countryside under the huge oak trees, not forgetting to "drink, out of devotion, the water of the Madonna that gushes out clear and fresh between two boulders a short distance from the Church". Many people go to look at Samson’s footprint present on "a small landing on a cliff that also rises at the Sanctuary". The belief in Samson, an unthinkably large giant, is widespread amongst the peasants of Torricella and in general in the Aventine Valley. In fact a "footprint" or Samson’s mark is also to be found at Lama in the locality known as "Calvary". Samson, "widening his stance, placed one foot on the mountain of the Madonna of the Roses and the other on the opposite slope, with all the Aventine Valley underneath him". The village’s patron Saints, S. Marziale, S. Vincenzo and S. Mariano are carried in procession to the Sanctuary and the Madonna is brought out to meet the other three statues. "The exit of the Madonna from the Church and the appearance of the patron Saints of Torricella amongst the sweet smelling parcels and crowned with broom (flowers) happens amidst the shooting of firecrackers, the sound of the bells and the renewed amazement of the peasants". The three Saints who are joined by the Madonna are said by the people to be her brothers. Previously the Madonna of the Roses had a small Chapel from which she did not want to come out. After people had made her a larger Church and had held more solemn Feast days, the Madonna consented to be brought as far as the door of her Church so that she could see her brothers. With even more solemn Feast days, magnificent and devout, the statue of the Madonna of the Roses, which before had been heavy and did not consent to being taken beyond the confines of the Church, "began to become lighter and today when the Feast day some years is really solemn, she allows herself to be carried for a short way beyond the Church across the stony pathway which leads towards the village ". A peasant woman, interviewed by Verlengia, asserted, magnifying the miracle, that with a very large Feast day, the Madonna could go all the way to Torricella, because "the Saints want to be honoured". "It is for this pious faith," Verlengia concludes, "that the peasants of the Madonna of the Roses are respectful and devout towards their Sanctuary and the little Madonna, so secluded in her white Church rocked by the winds, gathering not only roses on her Feast day but also tears of joy and mystic astonishment."